We look forward to this post every year. Is it our love of tech gadgets? Is it the joy of stuffing the stockings of the ones we love? Or is it that these delightful, albeit sometimes quirky, gadgets are wallet friendly? We are happy to state that it is truly a mix of all those things. If you don’t have stockings to stuff, or you prefer not to hang your socks near an open flame, the good news continue to get better. This post is still for you and your stocking-less chimney! Maybe that is why it is one of our favorite posts of the year; it can be enjoyed with or without socks. That’s right, we have scoured the internet for a list of tech gadgets that will bring a smile to anyone’s face and a sigh of relief to your budget. If you were alive in the 80’s, you have to remember the View Master. The View Master is back and in 3D for all to enjoy. The View Master VR uses the same platform as Google cardboard and supports both iPhone and Android users. Purchase the Viewer and then download the app(s) to be transported back to the 80’s to enjoy 3D images from all over the world. Cords. Can’t live with ‘em and definitely can’t live without ‘em. So what do we do? We organize them. When it comes to cord management, there are admittedly a lot of options, but we thought this “quirky” option was fun, inexpensive and simple. We don’t care who you are and how much you hate sharing, this stuffing stocker is BRILLIANT. If you are among the millions of parents trying to enjoy an adults-only podcast on a long drive with your small children in the car, you will enjoy this headphone splitter. Hook it to your keyring and never take it off. If you are like us, you hate tangled headphone cords and you love yo-yo’s. And that is why the Bluelounge Cableyoyo is on our list for 2018! 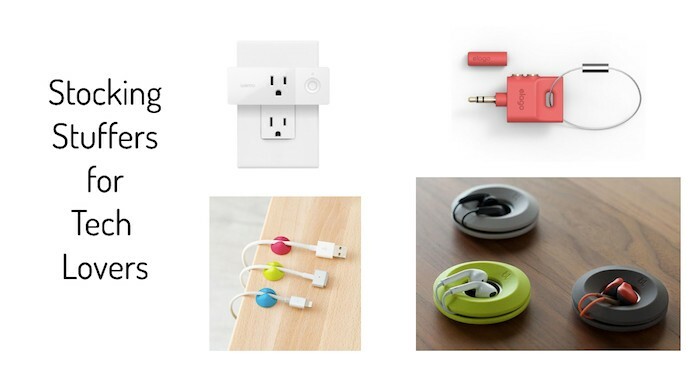 These headphone cord organizers are flexible, stylish and incredibly useful. Might be guilty of sliding one of these into my own stocking. In the age of screens, eye strain is a real thing. The Luminoodle Computer Monitor Bias Lighting is a solution that is easy to hook-up and inexpensive to purchase. By adding this simple lighting behind your monitor or TV you will not only be giving your eyes a better view but also an easier view. Compatible with both iOS and Android devices, this Bluetooth device makes selfies more ergonomically convenient. Just what a teenager needs – a more convenient way to take photos of themselves. We all have that one friend who is constantly cold. Well, this stocking option is a great way to warm their hands and their hearts. A little over the traditional stuffer price-point ($20-$25) but worth it if it keeps your friends quiet…..we mean warm. If you’ve ever turned around 40 minutes into a trip because you couldn’t shake the feeling that you left the space heater on or your burning hot hair straightener sizzling next to your aerosol hairspray, the smart plug is the answer to your worry. Luckily as electronics get smarter, we don’t have to. With a WiFi Mini Smart Plug you can turn lights and appliances on and off from your phone when you are miles away. This holiday season, we encourage you to opt out of gift cards and opt in to fun gadgets that are wallet and people friendly.